For the past four years, the Pavilion of Tibetan Culture of Auroville in Tamil Nadu has been welcoming groups of students from TCV schools during their annual Winter break. This year, 13 students between 16 and 20 years of age from Suja TCV have spent six weeks in the South Indian community. 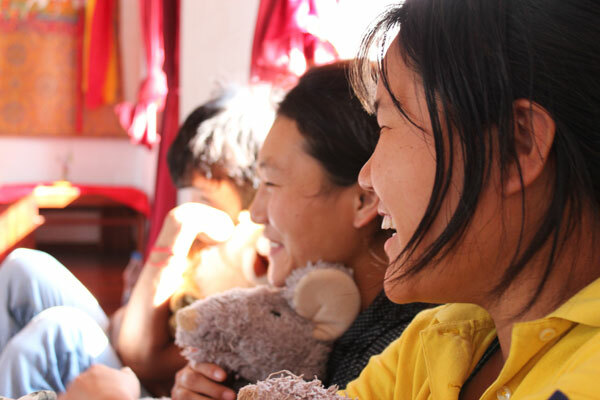 They have been busy with a variety of activities including arts and crafts, fencing, English communication classes, volunteer work, educational trips around the community and putting on a Tibetan cultural show. I had the pleasure to be involved with the English classes along with a few other volunteers. From what I have observed, the time spent in Auroville has been meaningful for these students as it represented a relatively rare opportunity to experience life outside the perimeter of their boarding school and to connect with people from all over the world (more than 50 nationalities are present in Auroville). Indeed, for several of the students, this was the first time they were out of Suja for a substantial period since they first joined the school years ago. I have heard only excellent feedback from the students about their school but I think they also appreciated the opportunity to experience something different. Auroville is a unique collective which explores human unity, cooperation, sustainable and ecological development, alternative schooling and evolution of consciousness – quite fertile ground to host curious Tibetan students and quite compatible with the Buddhist pursuit of being of service to others. 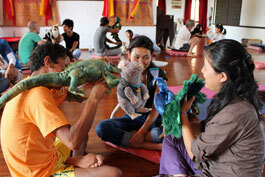 One of the more original activities that took place during those weeks was a role-playing workshop using puppets. 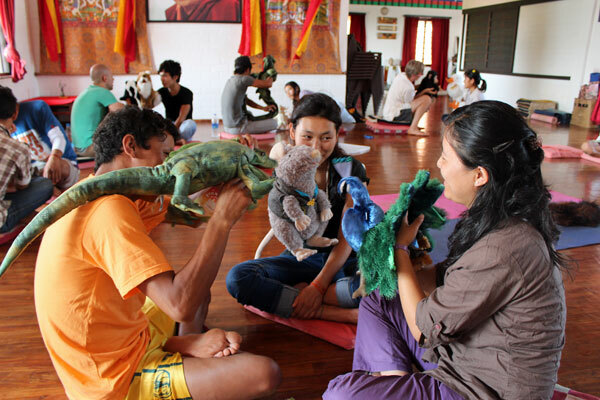 Each student chose an animal character and was led into different role-playing scenarios by the facilitator. I was surprised to see teenagers and young adults getting into the games and having fun with the puppets! But maybe I shouldn’t have been surprised… the time that I have spent with Tibetan youth in the past has generally revealed them to be open, playful and humourous. The time spent with the Suja group and Kalsang, Namgyal and the rest of the Tibetan family hosting the program at the Pavilion was wonderful. In addition to offer a special context for Tibetan youth to engage in self-discovery and creative endeavours, it reminded this Westerner that the best moments in life are those in which we are giving.